Former Bearcats defensive end Silverberry Mouhon says he has Coach Lewis to thank for his free agent opportunity with the Cincinnati Bengals. 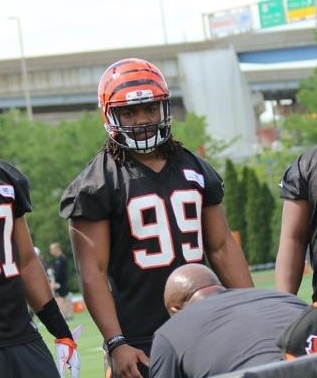 The son of Bengals head coach Marvin Lewis was an assistant to the University of Cincinnati coaching staff in 2013 during Mouhon’s sophomore year when he had a career-high 9.5 sacks. 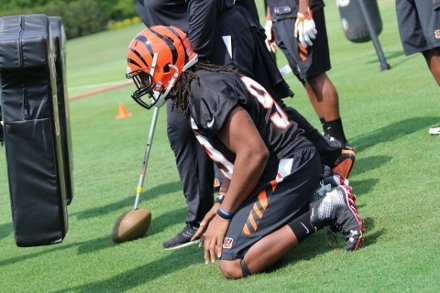 Marcus has been part of the Bengals coaching staff for the past two seasons, and encouraged Silverberry to join the team on a tryout basis during this weekend’s minicamp. Mouhon earned second team All-American Athletic Conference honors last year and was named the Bearcats’ defensive MVP despite battling injuries. The 6’3”, 260 pound defensive lineman trained under strength and conditioning coach Cliff Marshall in the offseason at the Ignition APG workout facility in Mason. Mouhon ran a 4.81 40-yard dash at UC’s pro day and did 27 reps on the bench press. While the Bengals depth on the defensive line likely means that Mouhon is battling for a spot on the practice squad that is not his objective. His task this weekend is to show the Bengals coaching staff that he’s worthy of being signed to a contract in order to get a longer look in training camp. “I want to show the coaches that I’m versatile and can play special teams or wherever they want me to play,” said Mouhon. Silverberry finished his college career with 19 sacks to rank fifth all-time at UC. After winning at least nine games in each of his first three seasons, the Bearcats finished 7-6 last season. As it turned out, one of those blessings was getting to know the son of an NFL head coach. “Marcus Lewis really helped me,” said Mouhon. “He said even if it wasn’t here in Cincinnati, I should keep my head up and he told me what to expect wherever I went. He said to keep working and an opportunity would come knocking.